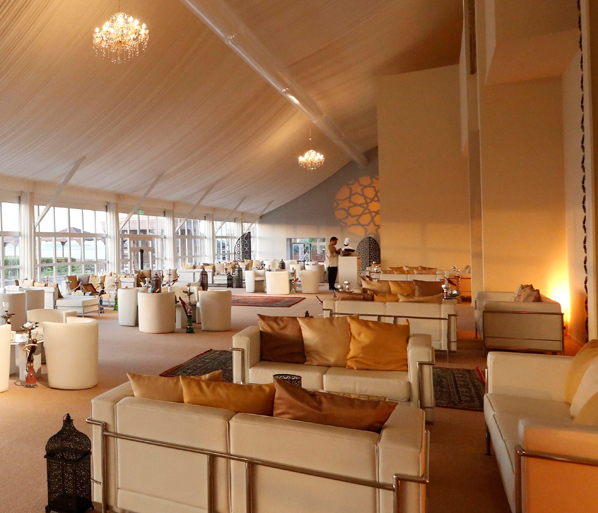 Breaking Travel News reporter Phil Blizzard continues his tour of Ramadan Tents in the GCC and this time takes at look at the Emirates Palace in Abu Dhabi, the capital of the United Arab Emirates. Abu Dhabi’s iconic landmark, the Emirates Palace, is managed by Kempinski, and showcase’s Arabian Culture at its finest and perhaps, even more so, during the Holy month of Ramadan. Situated on 1.3 km of private beach, Emirates Palace comprises 394 suites which offer spectacular views of the manicured lawns or the glistening blue waves of the Arabian Sea - allowing quest to watch the warm, colourful sunset which will signify the ‘breaking of the fast’ and the commencement of the Iftar meal. This important meal for those fasting, along with visitors to the Emirates Palace, takes place in the 2,400 square metre Ramadan Pavilion overlooking the beach on one side and the façade of the hotel on the other, and offers some interesting statistics. In total, 55 men involved in a 37-day construction for a total of 20,000 man hours. With 200 metres of tarpaulin wrapped around the structure, and finer details like a fabric ceiling, ornate fixtures and intricate lighting to play up the internal designs, the pavilion boasts a regal elegance perfect for Iftar and Sohour this Ramadan. We are very proud of our Ramadan Pavilion,” said Holger Schroth, general manager at Emirates Palace. “We made an impression last year by introducing the largest Ramadan Pavilion in Abu Dhabi, and this year will be even better. Emirates Palace is the premier meeting and conference destination in Abu Dhabi, attracting business drivers and influential decision makers from around the world. Within a total meeting and conference space exceeding 23,000 square feet, Emirates Palace plays host to a spectacular cultural calendar including the Abu Dhabi Film Festival and the best in world sports action the annual Coutts Polo at the Palace. The Emirates Palace has been awarded accolades by the World Travel Awards each year since 2005. More information can be found on the hotel’s official website.